HURRICANE – A Hurricane man found in possession of a stolen trailer, license plate and debit card during a traffic stop in Hurricane Wednesday claims he was set up. Hurricane City Police Officer Kacen Gubler observed a man traveling east on state Route 9 driving a black Ford F-150 and pulling a trailer with a tail light that wasn’t working, according to a probable cause statement written by Gubler in support of the arrest. 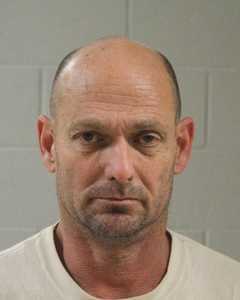 Gubler initiated a traffic stop and identified the driver as 53-year-old Kelly Lee Moore, of Hurricane. As Gubler was running Moore’s information, he noticed the license plate information on the trailer didn’t match the description of the trailer it was on, the statement said. The registered owner of the license plate was a man who Gubler knew was incarcerated in the Washington County Purgatory Correctional Facility. After making contact with the jailed man, the jailed man told police the plate was stolen and that he wanted to press charges. When Gubler asked Moore who the plate belonged to, Moore told him it belonged to his work and that it should be registered to them, the statement said. I asked (Moore) where the vin was for the trailer so I could verify the trailer belonged to the company he worked for. (Moore) showed me where the vin should be but no vin was there. (Moore) stated he did not know where the vin was and that he put that tabbed vin there himself. Moore was placed under arrest for being in possession of stolen property. As Gubler searched Moore’s wallet, he located a debit card with another man’s name on it, the statement said. When Gubler asked Moore who the card belonged to, he told him he did not know. When Moore was asked why the card was in his wallet, he told Gubler he didn’t know and that he didn’t know the person whose name was on the card. During an inventory of the Ford truck, officers discovered a glass pipe containing a reside that tested positive for methamphetamine, according to the statement. Moore was booked into the Washington County Correctional Facility. Moore was charged with three third-degree felonies for unlawful acquisition of a finance card, drug possession and vehicle parts without identification number; two class B misdemeanors for theft and possession of drug paraphernalia; and one class C misdemeanor for operating an unsafe vehicle. Moore was released from custody on $25,720 bail. He is scheduled to make his initial court appearance on April 1. I wonder if this guy even knows the meaning of the word ACCOUNTABILITY? Jeez! His set up story is not clear. Hahaha, the ole someone put someone else’s card in my wallet. I was set up! He is LYING. I know him. He is the scariest person I have ever met. Ya, and could even come up with a plausable set up story. Guilty! Guilty! Guilty! Maybe he is the Bulls pens! Ya, buddy, play dumb with the cops. It works every time. Dang tweeker.